We have a very exciting fall planned this year! We have become a part of the Combined Federal Campaign for the first time and you can choose to donate, if you are a federal employee or retiree, using our CFC #35202. As always you can continue to donate through this website and the PayPal Giving Fund. It is great to be able to be a part of the world’s largest worksite fundraising campaign. We also have some exciting events to participate in here at the station and across the community. 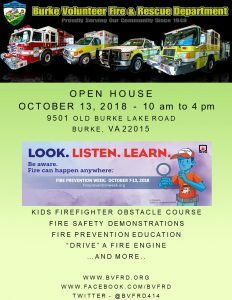 Our annual Open House will wrap up Fire Prevention Week on Saturday, October 13th, at the fire station, 9501 Old Burke Lake Road, from 10 AM to 4 PM. We will also have our second annual Pancakes with Santa breakfast on Saturday, December 8th. The pancake breakfast will come in conjunction with the beginning of our long-standing tradition of Santa runs through the community. Look out for these great opportunities to engage with us at the station or come out to see Santa as the holiday season approaches.